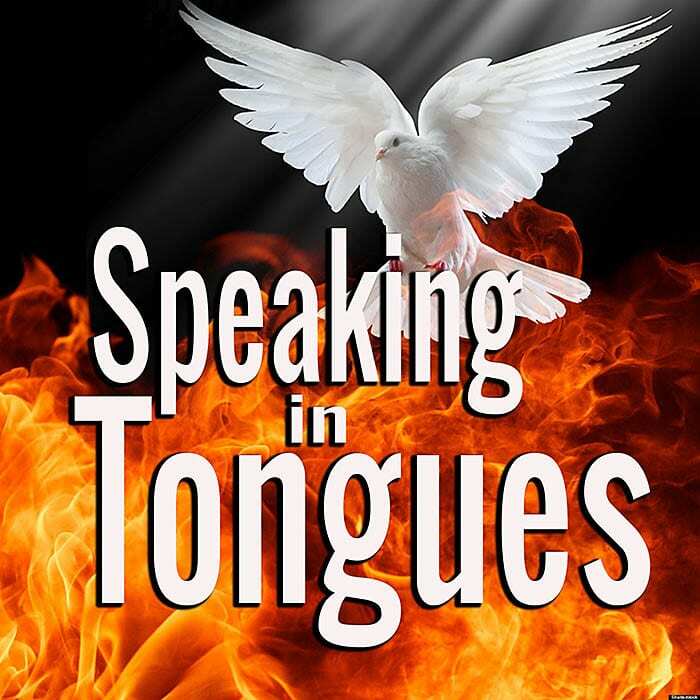 What is speaking in tongues and why does God say in 1 Corinthians 14:5 that He would like each Christian to do it? No doubt that is a question that has been asked by millions of Christians throughout the centuries and we believe that knowing the answer is vital for maximizing the quality of one’s life as a follower of the Lord Jesus Christ. Why? The primary reason, as a study of Scripture will clearly show, is: speaking in tongues is the only absolute proof a Christian has that he is born again and guaranteed a parking place in Paradise, i.e., everlasting life (2 Cor. 1:21 and 22; Eph. 1:13 and 14; 1 John 3:24). Speaking in tongues is the only valid external, tangible evidence in the senses realm that the internal, intangible gift of holy spirit was shed abroad in one’s heart at the moment of his New Birth. Please do not hear me saying that you must speak in tongues in order to be born again. No, anyone who adheres to Romans 10:9 is saved, permanently. Why? Because at that moment he is born again of incorruptible seed (1 Pet. 1:23 – KJV). But, as we will see, speaking in tongues is the vitally important proof that you are forever a child of God. The second most important thing about speaking in tongues is that it vividly illustrates to the believer the most basic principle of the Christian walk, which is trusting the Word of our heavenly Father. Beyond that, speaking in tongues is a beautiful way to circumvent the limited vocabulary of our native tongue and tell our Father that we love Him. It is a way to perfectly worship (Phil. 3:3) and praise (1 Cor. 14:16) the Creator, to give thanks well (1 Cor. 14:17), to speak the wonderful works of God (Acts 2:11 – KJV), to magnify Him (Acts 10:46 – KJV), to edify yourself (1 Cor. 14:4) and to build yourself up in faith (Jude 20). And if you have never done it, I will help you do so via this article and the video at the end of this article. As with many important biblical issues, an understanding of speaking in tongues relates specifically to an understanding of the administrations in Scripture! Unless we understand what parts of God’s Word are written to Jews, what parts are written to Gentiles, and what parts are written to Christians, we can neither understand nor apply its truths in our daily lives. For an overview of which parts of the Bible are written to you, click here! We are currently living in what the Bible calls the Administration of the Sacred Secret (Eph. 3:9), which began on the Day of Pentecost (Acts 2:1ff) and will conclude with the gathering together of the Church (all living and dead Christians) to meet the Lord in the air (1 Thess. 4:13–18). Unique to this administration is the salvation a person attains by adhering to Romans 10:9—confessing with his mouth “Jesus is Lord” and believing in his heart that God raised him from the dead. At that moment he is “born again of incorruptible seed” (1 Pet. 1:23 – KJV) and baptized/filled with the gift of holy spirit (Acts 1:5, 2:38). As the Word says of each Christian, God has “anointed us, set his seal of ownership on us, and put his spirit in our hearts as a deposit, guaranteeing what is to come” (2 Cor. 1:22). Amen! “To show you that I have the authority to forgive sins—watch this: Pick up your mat and go home.” And the paralyzed man was healed! What’s the point? When Jesus told the man that his sins were forgiven, no one could see anything happen. The Pharisees saw no change in the man so they said that Jesus’ words were bogus—the man’s sins were not forgiven. Jesus said, “Really? OK, let me try saying something else and see if that happens…Well, what d’ya know? Look at that.” He gave them indisputable proof in the senses realm that something had happened inside the man. Ditto for the New Birth and speaking in tongues. NOTE: Many Christians mistakenly refer to speaking in tongues, prophecy, etc., as “gifts” of the spirit but Scripture never does (except in modern translations that add words to the Greek text but do not italicize them like the KJV does so the reader knows this). The (one) gift is holy spirit, the divine nature of God, who is called “the Holy Spirit,” the Giver. The gift He gives is holy spirit, His divine nature. If someone gives you a Swiss Army® knife or a Leatherman® tool, you get one gift, but within that gift are many ways to use it—many “manifestations.” Likewise, anyone who is born again of God’s spirit has the ability to utilize all nine manifestations of the spirit. Most need only a little instruction. Every Christian can speak in tongues whenever he decides to do it. And if you do not speak in tongues, that includes you. Stay tuned for instructions on exactly how to do it. Do you know that all but two of the nine manifestations of the gift of holy spirit were operational in the Old Testament and the Gospels? Only speaking in tongues and its companion manifestation, interpretation of tongues, are conspicuously absent prior to the Day of Pentecost. The question then becomes: What is so unique about speaking in tongues that God reserved it just for us who are born again of His spirit? It is not what is unique about speaking in tongues, it is what is unique about salvation in the Church Administration that necessitated speaking in tongues as the indisputable proof of that unconditional salvation. In no other administration was salvation equated with seed, birth, and therefore permanent sonship. At no other time was salvation permanent and no one ever dreamed it would be. Talk about “the world’s biggest deal? !” This is it! And God came up with a proof that to the ignorant may seem absurd but which is actually very ingenious and practical. But wait a minute—you can’t feel the holy spirit, so how is that spirit the guarantee? By the manifestation of the spirit known as speaking in tongues, which only Christians can do. Speaking in tongues is how the spirit itself bears witness with our spirit that we are the sons of God (Rom. 8:16) and, with the verse properly punctuated, it is what 1 John 5:11 refers to as “…the witness that God has given us eternal life….” Hey, that fits perfectly with Acts 1:8 when Jesus told his disciples that when they received the holy spirit they would be witnesses of him. Why? Because they would then have within them his witness to them that they were equipped with all they needed to go forth in his name! To speak in tongues is to fluently speak a language of either men or angels, a language that does not come from your mind but by way of God’s spirit within you. It is primarily designed for one’s internal use but it is also to be utilized in a gathering of Christians by following it with its companion manifestation, interpretation of tongues, so that the Church is edified by one’s praise to God (1 Cor.14:5b). “Tongues” is a language that God gives you, just as He first did on Pentecost when the Church was born. And that record in Acts 2:1–4 brings up the pattern God intended for every Christian, which is that each one speak in tongues right after he is born again. Why? So that one immediately knows once and for all that (a) he has everlasting life, (b) the Word of God is true, (c) Jesus Christ is alive, (d) he is filled with the power of God and can utilize all the other manifestations. That is why God clearly says in 1 Corinthians 14:5 that He would like each Christian to speak in tongues. I think that for our Father hearing a newborn Christian speak in tongues parallels how a mother feels when she hears her newborn baby make its first cry—it’s alive! The difference is that when God hears a child of His speak in tongues, He knows that life will be forever. How tragic that countless Christians never take advantage of this marvelous ability. They don’t because they can’t—if they are taught that speaking in tongues ended with the first-century Apostles, or that it is devilish, or that it is a gift for only some people, or if they are taught nothing at all about it. In the past 35 years I have had the awesome privilege of helping to lead thousands of dear saints into speaking in tongues, some of whom were 60–80 years old and had longed for it for decades. With a few minutes of instruction they easily did it and many cried tears of great joy. Good question. The second vital truth about speaking in tongues, and also why God wants every Christian to start doing it immediately, is because it perfectly illustrates the “bottom line” principle of the Christian walk, which is trusting God and His Word. How so? Think about it—God goes first, if you will, and gives His Son for us. Jesus takes his turn and goes to the Cross. God raises him and promises us salvation. Now it’s our turn. If we believe Romans 10:9, it’s God’s turn and the Lord Jesus fills us with holy spirit (Acts 2:33). God says, “I would like everyone of you to speak in tongues…” (1 Cor. 14:5a). Does that require any faith, any trust in God, Jesus Christ, and the Word? It sure does, and isn’t that what being a Christian is all about? It always comes down to whether or not we really believe what God says. Want a biblical record that vividly illustrates exactly the same principle involved in speaking in tongues? Matthew 14:25 and following. The disciples are in their fishing boat amidst a great storm on the Sea of Galilee. Jesus strolls by—on the water. They freak out. Now put yourself in Peter’s potentially soggy shoes. Does he have a promise? Yes. What is it? That he can walk on the water—Jesus wouldn’t ask him (or you) to do anything he couldn’t do. And with the promise comes a provision—“If you step out, I’ll help you.” Now it’s Peter’s turn. How will he find out if the promise is true? There’s only one way—step out of the boat! And he did! But it was not until the split second his foot touched the water that God “took His turn” and made it firm under his feet. Had Peter put his foot one inch from the water and said, “Oh, this won’t work,” he never would have experienced the power of God. See the principle? It is exactly the same in regard to speaking in tongues. If you are born again (if you’re not sure, see Romans 10:9 for instructions), you can speak in tongues. How do you know? Because God would not ask you to do something you cannot do. And He clearly says, “I would like for you [each Christian] to speak in tongues” (1 Cor. 14:5). And, as we have set forth, He gives you plenty of incentive and motivation by laying out its benefits. So whose turn is it now? Right—yours. What do you have to lose to give it a shot? OK, if you’re online during a break at work amidst a gaggle of co-workers, you better wait ‘til you get home. Good, you’re home. So, how do you do it? Simple—you just open your mouth and utilize the mechanics of speech but do not speak English or any other language you know. What you will be speaking is whatever language God chooses to give you. If it is a language of men, someone somewhere on the earth (among the approximately 6000 or so dialects) could understand it. If it’s a language of angels, no one on earth would understand it. Now hear this! When it comes to speaking in tongues, there is only one way to fail—and that is not to speak. Please hear me. If you open your mouth and speak (not a language you know), it cannot fail—you will speak in tongues. Now then, if you do move your lips, your throat, your tongue, and formulate different words and you fail to speak in tongues, do not call me—call the Guinness Book of Records because you will be the first human being since the Day of Pentecost for whom it didn’t work. If it does work, I’d love to hear from you. Just as with Peter’s foot touching the water, so God cannot give you the words until you speak. Do you see how this perfectly illustrates what the Christian life is all about? God makes many promises to us but the only way they come to pass is when we act on them. Our heavenly Father makes wonderful promises to us because He adores us, and oh, how He longs to fulfill them to us for our benefit. So why not relax, take a deep breath, let it out slowly, and focus your mind on the God and the Lord who love you immeasurably. Thank them for having filled you with the holy spirit, take another breath, and let it rip—speak forth words of praise, thanksgiving, and worship. And that is exactly what you will be speaking. And be BOLD—the words you are hearing are the proof that Jesus is alive and well—and that so will you be—forever! It cost him his life for you to be able to praise and worship God in this wonderful way, so get into it! One more thing—not only will you hear the words you are speaking, like when you speak in your native tongue, but because you are not using your mind to speak in tongues, you can also listen to what you are saying—and that is why it may sound really strange at first. But so would any language you’ve never heard before. If you decide to speak in tongues now and it is your first time, keep doing it for a while so that you become convinced that it is real. The junk part of your mind may tell you: “That’s ridiculous, you’re just making it up.” Here are some appropriate replies (that are printable): “No way—I couldn’t make that up.” “Take a hike.” “Get lost.” “Put a sock in it.” “SHUT UP!” Just keep speaking in tongues and eventually that part of your mind will get tired of telling that lie to you. In closing, let me say how moved I am at the amazing privilege of sitting here at my computer (first at the office and now at the Ford® dealer who is fixing my car) and writing something that dear people like you (from Alabama to Afghanistan, Bakersfield to Borneo, Cleveland to Calcutta, etc.) will read and then speak in tongues for the first time. My heart is with you. Go for it!